- These are arguably the two most basketball-mad countries in Asia, but it's rather unfortunate that they are now relegated to the consolation round after getting bounced in their respective Quarter-Finals matches. That doesn't mean this won't be a hotly contested affair, though. Lebanon have a bone to pick with Gilas Pilipinas after the Filipinos were the ones who eliminated Lebanon in the FIBA Asia Championship 2015. Winning here would be sweet revenge for the hosts, who are still hoping to end their campaign on a bright note despite no longer able to win the title. They need to beat the Philippines here for that to happen. - Gilas were crushed - literally and figuratively - in their loss to Korea. They have always viewed Korea as a bitter rival, and nerly every loss to them carries a distinct sting. The one that happened in the Quarter-Finals was especially painful, given how Korea just flat out destroyed the Philippines, winning by 32 big points. The Filipinos just did not have the needed level of defensive intensity to neutralize Korea's superbly efficient passing and shooting. They are hoping to still put on a good show here against the hosts, but they will be handicapped as key frontliner Christian Standhardinger returned to the Philippines to join the Gilas Cadets in their mission to retain the gold medal in the Kuala Lumpur SEA Games. - Matthew Wright was not maximized in Gilas's loss to Korea. He took just 5 shots and made just 1 triple on his way to a tournament-low 6 points. For sure, the Phoenix sniper is raring to have a bounce back game, especially after being named one of the top 5 3pt shooters in the tournament. - When Gilas needed someone to keep them afloat against a hot shooting KOR, Romeo stepped up from the bench, scoring 22 points in a single quarter as Gilas remained in striking distance at the half. He was shut down in the last two periods, but he remains one of the most dangerous and explosive players for Gilas. His matchup with LBN's Wael Arakji should be one to watch. Stats: 18.8ppg. 3.0apg, 3.5 triples per game. vs KOR: 22pts, 1ast, 6 trilpes. - One other matchup to watch here is between our very own Gabe Norwood and LBN's Fadi El Khatib. It will be a classic matchup of defense vs offense, with Gabe's defense crucial in trying to stop El Khatib. Gabe was visibly frustrated several times in PHI's loss to KOR, so he wants to do well here. He knows this may well be his final Asia Cup appearance (same with Fadi), so don't be surprised if he leaves everything out on the floor. Stats: 5.3ppg 4.8rpg. 2.8apg. 1.0spg, 1.5bpg, 1.0 triple per game. vs KOR: 0pts, 2rebs, 2asts, 1blk, 0 FGA. - Wael Arakji was a very vocal and talkative opponent for Gilas in 2015, and he is surely hoping to get revenger here, especially in front of their own home fans. He has become LBN's new star scorer, and his duel with Romeo in the backcourt is definitely one to watch. He has been on fire in LBN's last three games, too, so it's reasonable to expect he will score a ton here again. Stats: 16.4ppg,. 4.4rpg, 3.8apg, 2.0spg, 1.2 triples per game, 57.9% FGs. vs PHI in 2015: 8pts, 2rebs, 2asts, 1 triple, 3/5 FGs. - The 38-year-old icon continues to add to his legend. He has had two 30-point games already this tournament, and nobody should be surprised if he wants to add more to that here against the PHI. Fadi knows how big basketball is in the PHI, and for sure he would not want to disappoint the millions who will certainly tune in to this match. He will be a handful for Gabe Norwood, Calvin Abueva and the other Gilas wings, and his production will be important in seeing if they can indeed upend the Filipinos. Stats: 23.0ppg, 5.4rpg, 4.0apg, 1.2 triples per game, 45.9 FG%. Last game (vs IRI) - 18pts, 2rebs, 2asts, 1stl, 1 triple. - LBN has lived and died with their transition game, and that will hold true again here against PHI. The Cedars love going on the break, and that will be an important weapon against a Gilas team that has had more than its fair share of injuries throughout the competition. 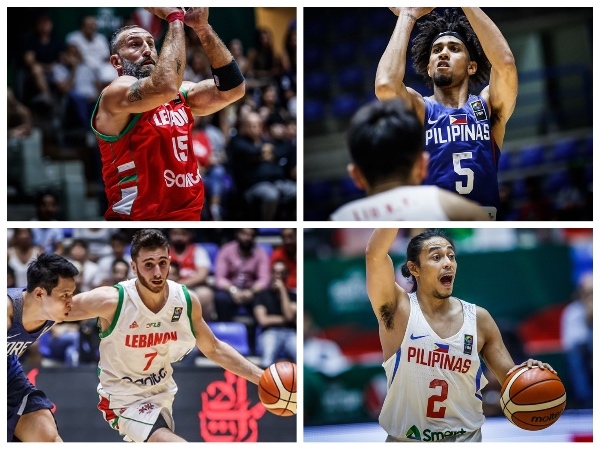 If guys like Arakji, El Khatib, Amir Saoud and even Norvel Pelle can go out and run, Gilas will be in helluva lot of trouble.